Suntech has replaced the Kaname Special described below with a new model, the Kaname Special NP II F. The stats appear to be almost identical, although the tippet recommendation is now Japanese size .15 to .8 rather than .1 to .6. For American anglers, the difference between .1 and .15 is essentially nonexistant. The 10X Varivas tippet I carry is Japanese size .15 and I don't know of any lighter tippet available in the US. The change from .6 to .5 is meaningful, though, as that equates to a change from 6X to 5X. Suntech has added a 5.5m rod which would likely be a wonderful rod if you are looking for a rod of that length. The only other visible change is cosmetic. The grip section for the new Kaname Special F is purple rather than looking like marble. The accent stripes on the smaller sections are purple but the main body of the rod is still a matte gray. I first saw a Suntech Kaname Special almost five years ago. It was love at first sight (or maybe first cast). A customer ordered a Kaname Special 70NP and offered to let me take it out to see if it would cast a size 3 line. It did - wonderfully. Only a few weeks before that I had gotten a Suntech Kaname 2H 63, which I thought was a magnificent rod. The Kaname Special, though, was much, much nicer. I have wanted one from that day forward. Photo is of previous model. The Kaname Special 60NP is only a foot shorter than the Kaname 2H 63, but it is 6/10 of an ounce lighter, at 3.7 ounces without the tip cap. That's as light as the Kurenai Long 61, which is pretty amazing considering that the Kaname Special collapses to a fairly standard 22 7/8" rather than the 45.5" for the Kurenai Long. And like the Kurenai Long, it is one smooth casting rod! The Kaname Special does not have the Kurenai Long's 4X tippet rating (Suntech recommends tippets no stronger than 6X for the Kaname Special) but I think people may be overly concerned with tippet ratings. 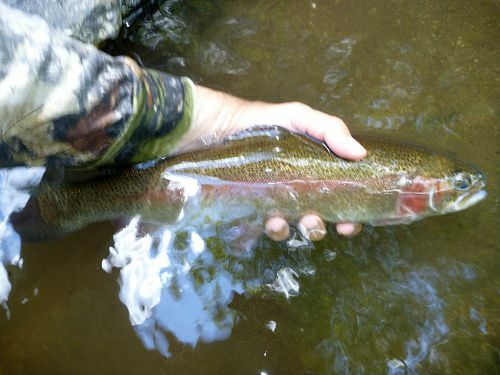 A long, supple rod can subdue larger fish than you would expect and can still protect light tippets. The smallmouth bass and rainbow trout shown below were caught with a Suntech Aoi ZPRO rather than a Kaname Special, but they were both caught with 6X tippets. With a rod designed to protect it, 6X tippet is capable of landing pretty respectable fish. Although it can handle some mighty nice fish, the Suntech Kaname Special is still fun with the 8 or 10 inchers. After all, it was designed to protect tippets as thin as Japanese size .1 (thinner than Varivas 10X tippet), and a 10 incher is about as big as you can actually catch with 10X tippet. The wild brownie above was caught with 10X tippet and an overhand worm (tied with pink rubber panfish-popper leg material on a size 32 hook). That will put the challenge back into your fishing! Sure, it's only about 8 or 9 inches long, but the fish right after that, which couldn't have been any bigger, tailwalked its way to freedom. It was a unique sight, and I'm going to remember that battle much longer than the one with the fish that didn't get away. Now I'll admit that 10X is a bit extreme, but the keiryu anglers in Japan who specialize in fishing with extremely thin tippets are convinced that it provides much more natural drifts than you could possibly get with 5X or 6X. It's the same reason midge fishermen on highly pressured water here in the states fish with long leaders and fine tippets. As the photo in the upper right corner says, the rod is super sensitive. 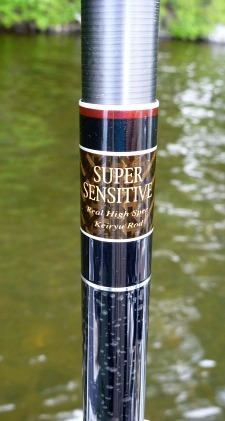 It may not be obvious until you think about it, but a stiffer rod is more sensitive than a softer rod. A soft rod bends easily, and the bend absorbs rather than transmits the feeling of the slightlest tap on the line or head shake of the fish. A rod that doesn't bend as easily transmits the feel of a take better than a rod with a very soft tip. 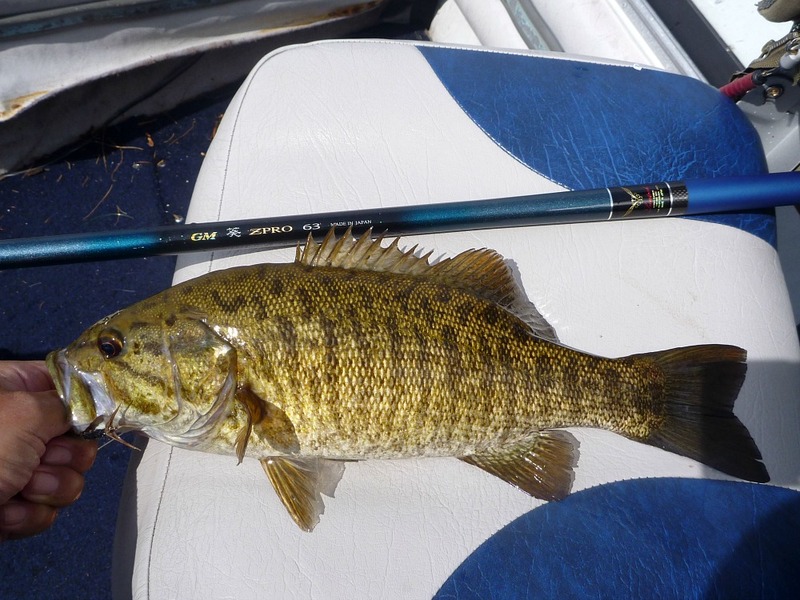 The Suntech Kaname Special is just a bit firmer than the other Suntech rods that are rated down to 10X. It's not so stiff that you can't fish 10X, but it is a lot more sensitive than the others. If instead of 10X you wanted to fish a much more reasonable 8X or even 7X, and wanted to feel every little tap, this would be the ideal rod. If you are fishing with flies and a light tenkara line, as I suspect most buyers would, the Suntech Kaname Special makes a very nice big water tenkara rod. It's very light, it's very sensitive, it's very portable. It's just a very, very nice rod. Above the grip section, the Kaname Special has Suntech's "non paint" finish, which I really like. It is a matte gray rather than a shiny black, so you will not have to worry about rod flash scaring the fish. The rings look white in the photograph, but they were actually silver. The new version of the rod has gold rings rather than silver, and no longer has the red ring. 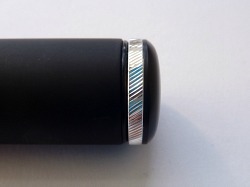 The grip screw cap appears to have the same silver band as the previous model (shown above), which provides an excellent and very stylish non-slip grip. 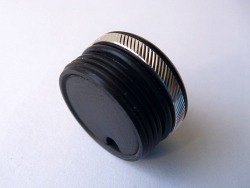 The cap has an "0" ring to keep it tight and also has a hole for ventilation. As with all the other Suntech rods I've seen, the lillian is attached with a swivel that easily passes trough the second section so you can take the rod apart to dry between uses. The NP II 60F comes with a Fuji KTC-20 rod cap, a stretchy knit rod sock and a one-year limited warranty. Length and weight data from Suntech stats. Weight and collapsed length appear to be without the Fuji-style rod cap. Kaname Special rods are available by special order. The kaname special is NICE! I'm really excited. It looks and feels very good in the hand. Kinda amazing how light it feels for how long it is.